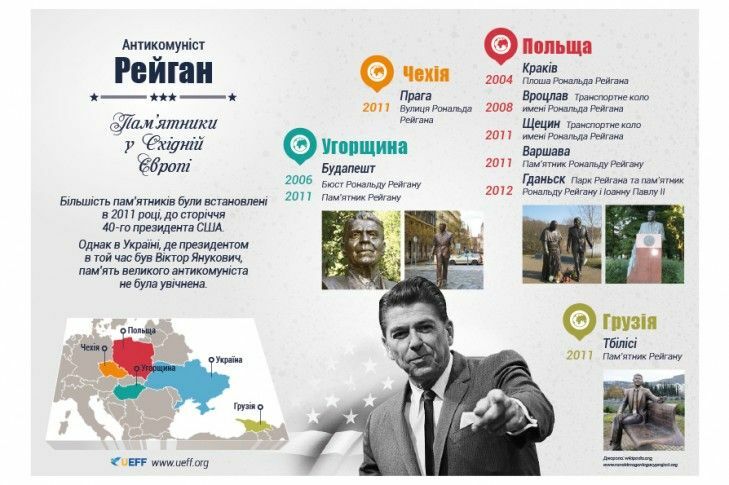 Kyiv residents have offered the Kyiv municipal authorities to consider erecting a monument to U.S. President Ronald Reagan, an UNIAN correspondent reports. "Reagan until his last days was a staunch defender of the independence of Ukraine and other countries affected by the communist system," reads a statement accompanying the petition. The authors proposed to put a monument at the intersection of Lypska Street and Instytutska Street, at the site of a demolished monument to the first secretary of the Central Committee of Communist Party of Ukraine, Dmytro Manuilskyi. Read alsoKGB monument in Kyiv demolished on fourth attempt (photos, video)“The monument will be a symbolic reminder of the priority of such concepts as freedom, dignity, stance toward own people over personal goals and desires," the authors say. A corresponding e-petition on the website of the Kyiv City State Administration has already gathered more than a thousand signatures of the 10,000 required for its consideration by the Kyiv City State Administration.